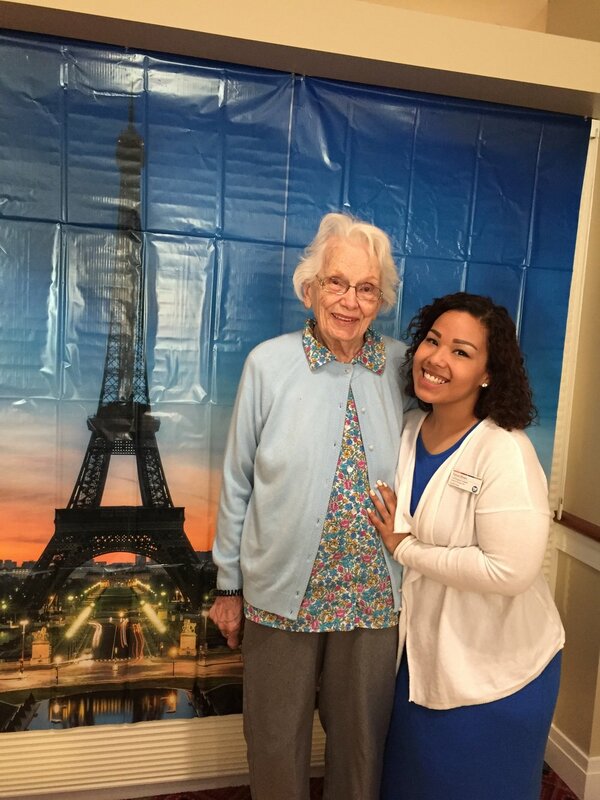 Youville resident Alice Raulinaitis, pictured with Lead Programs Assistant Yanira Motto, drafted the initial proposal for what would become the Citywide Senior Center in Cambridge. In 2013 the Huffington Post published an article about an 89-year old holocaust survivor named Thea Aschkenase. A resident of Worcester, she began taking public policy classes at her state university through an “elder education” program. Through the school she became involved with a hunger outreach organization, and was able to draw profound connections to her personal experiences during World War II. The opportunity to speak out about hunger in her community, more than half a century after her experience in Auschwitz, gave her life a new direction. Ms. Aschkenase began speaking regularly to local civic organizations about the effects of hunger on children. She began volunteering regularly at a local high school, campaigned for a free breakfast program, and became a central figure in her community. Personal experiences are the fuel for policy interests and public action. One of the most inspiring aspects of working in an assisted living community with older residents is their inevitable swell of stories. Residents in their 80s and 90s have lived through the Great Depression, the hope of Roosevelt’s New Deal, global conflicts, the fight for civil rights, upheavals in popular culture and explosions in technology. Their stories tie in to nearly a century’s worth of important events. At the same time, one’s personal experiences don’t have to tie in to earth-shaking historical events in order for them to spark civic action. One can find opportunities to make a lasting difference just by being observant. One Youville resident, Alice Raulinaitis, lived in Cambridge her entire life. She and her husband saw the city they loved go through decades of change and new development. It wasn’t until after Alice retired from her position at Massachusetts General Hospital that she found and got involved in local politics. Alice visited the Senior Center in Somerville and was impressed. At the time, there was no such service for senior citizens in Cambridge. “I just got to talking with my friends and wondered why couldn’t we start something like this in Cambridge?” wrote a letter to the Cambridge Chronicle and ultimately pitched the idea to the City Council. She started a group that became known as “The Penny Rollers,” because they would sit and roll pennies as part of the fundraising efforts for the new Senior Center. Thanks to her efforts, the Citywide Senior Center became a reality on 806 Massachusetts Avenue, where it still stands today. Alice was present at the ribbon cutting. Maintaining a spirit of civic engagement can be an invigorating experience at any age. Compared to many areas in the world, we are lucky to have the opportunity to make an impact on public life – we are reminded of this every time an election year approaches. We can support policies and candidates that speak to our deeply-held personal convictions, and our choices influence the course of history. Voting is one of the most fundamental civic responsibilities, but it is not the only one. There are many ways and a host of great reasons to get involved with a cause, especially if you are an older adult. After you step out of the polling booth on November 8th, you might consider additional ways to be active in your community. If you’re not sure what cause should be “your cause,” take a moment and think about a personal story. It could be about something of great importance that happened to you once, something that has shaped who you are or how your life turned out. You will likely find that this story connects to a larger, more public issue.